We have multiple tablecloth sizes to choose from depending on the size or length of your display table. We also offer many different table cover styles and table cover fabrics to select from, allowing you a full range of customizable tablecloth size options. 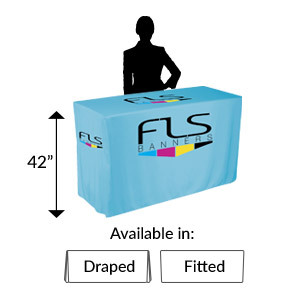 4 Foot Table Covers fit folding tables with standard dimensions of 48” long, 24” wide, by 36" high. 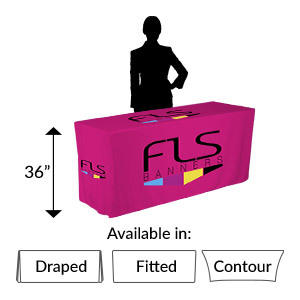 8 Foot Table Covers will cover display tables with standard 8’ dimensions of 96” long, 30” wide​, by 29" high. Fitted table covers sleeker look because they have straight seamed corners that create a ​box fitting look. What is the difference between a demo height table and a bar height table? How do you find out what is most appropriate for your needs? Let’s compare. A standard table is about 30 inches tall. Comparatively, a demo table is typically 36 inches tall. The demo table height is popular because it also typically has more surface area. You can also be seated in a lower chair at this height while storing trade show supplies beneath. 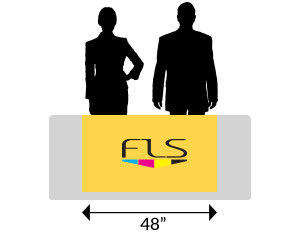 Bar height, or also known as counter height tables are 42 inches high. Bar height tables are great for events that have limited space or you plan on being in a corner. Because you can stand by them with the top within an easy reach, they are popular for standing and space-saving. 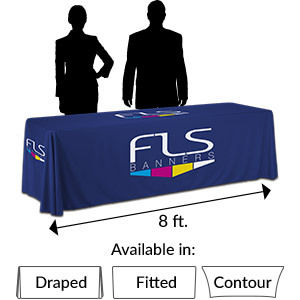 In addition, all table covers offered by FLS Banners are certified FR, or flame retardant. This means the table cover fabric will comply with fire safety standards at professional events and trade shows. When should you use a table runner? Many professionals use table runners as an attractive centerpiece for a table because it has the most versatility and can be used for multiple table lengths. Since table runners are intended to hang over the front and back ends of a table without draping over the left and right sides, you should keep in mind the approximate length of your table. Generally, table runners should be long enough to hang over the end of your table by approximately 6 to 10 inches on each end. If your table is 6 feet (72 inches) long, the table runner should be 84 to 92 inches long. If your table is 5 feet (60 inches) long, your table runner should be 72 to 80 inches long. The same principle applies for other sizes too. A 4 foot table should be paired with a 60 inch table runner or an 8 foot (96 inch) table should be paired with a 108 inch table runner. What size table cover you need depends on the size of your table. 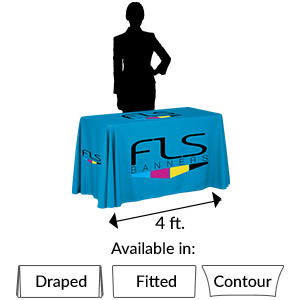 FLS Banners offers 4ft, 5ft, 6ft, and 8ft table covers for each of these table sizes. Our most popular table covers drape (excepting fitted or stretch table covers) over your table to just above the floor for a clean, professional look. 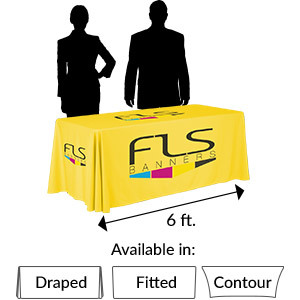 FLS Banners offers multiple sizes of table covers that fit the most common folding table sizes. 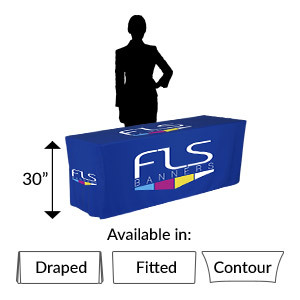 We will provide a table cover that fits your trade show table beautifully every time. What size tablecloth do I need for a 4-foot table? 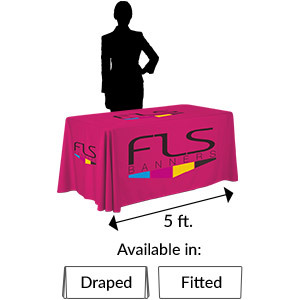 The most common 4-foot tablecloth size fit folding tables with standard dimensions of 48” length, 24” width, and 36” height. 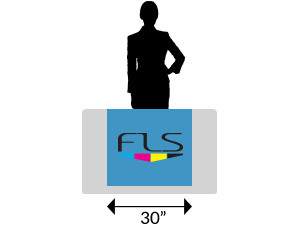 Commonly referred to as Demo tables the 36-inch height is excellent for product demonstrations. Note that some of these tables do offer an adjustable height. We recommended that you verify the height you will set your table. What size tablecloth do I need for a 5-foot table? The 5-foot tablecloth will cover display tables with standard 8’ dimensions of 60” long, 30” wide, by 29” high​. While not as common as the other three sizes we do get requests for 5-foot tables, so we have perfected the cover. What size tablecloth do I need for a 6-foot table? The 6-foot table cover fits rectangular utility tables with standard 6’ dimensions of 72” long, 30” wide, by 29” high. Not you may see the table height referred to as 30-inches. We have found that 29-inches is universally the best height for these tables. A 6-foot cover is also the most versatile size. Purchase the draped style cover, and in a pinch, you can use a 6-foot cover on an 8-foot table as well as a 4-foot table. What size tablecloth do I need for an 8-foot table? The 8-foot tablecloth will cover display tables with standard 8’ dimensions of 96” long, 30” wide, by 29” high​. 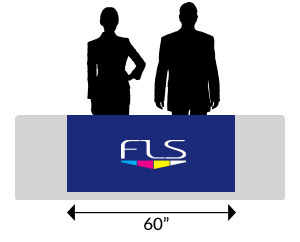 8-foot is the second most common size table we manufacturer. What is the standard size for a rectangular table? Standard rectangular tables are usually 30 inches in height. Length and height dimensions vary depending on the three most common sizes, 4 foot, 6 foot, and 8 foot. How much should a tablecloth hang over the sides? Our open back covers will cover the top, front, left and right sides to just above the floor. For the most professional look, we suggest keeping the cover just above the floor. There is a back panel on the Open back covers that hang down approximately 10-inches — this added fabric help to balance the cover and keep it in place. The open back makes it easy to sit behind the table for registration or welcoming table as well as creates convenient access to material you have stored under the table. The closed back style cover also covers the top, front, left and right sides as well as the full back. The cover again should hand to just above the floor. The full back panel helps create additional storage under the table as well as creates an additional brand opportunity that you can decorate at no additional cost.